The Student Excellence Foundation has been privileged to partner with Community Unit School District 200 to help bring Business INCubator to our District. Beginning in 2017-2018, Wheaton North and Wheaton Warrenville South High Schools offered students an authentic, collaborative, entrepreneurship experience through a new course, Business INCubator. At the completion of the Business INCubator course, similar to the hit TV show Shark Tank, student groups compete for investment funds from the program’s Board of Advisors or “Sharks”. 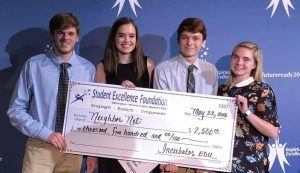 We are excited to announce that Team Neighbor Net from Wheaton North High School won the $2,500 Investment Award grand prize sponsored by the Student Excellence Foundation. 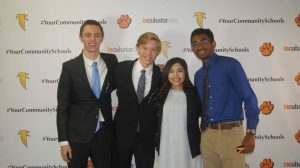 In addition, team Arctic Pillow from Wheaton Warrenville South High School received $1,000 for the Best Incubation Award from the Wheaton Chamber of Commerce.